The Friendable (OTC Pink: FDBL) app continues to utilize marketing initiatives for increased exposure from celebrities and artists in the music space. 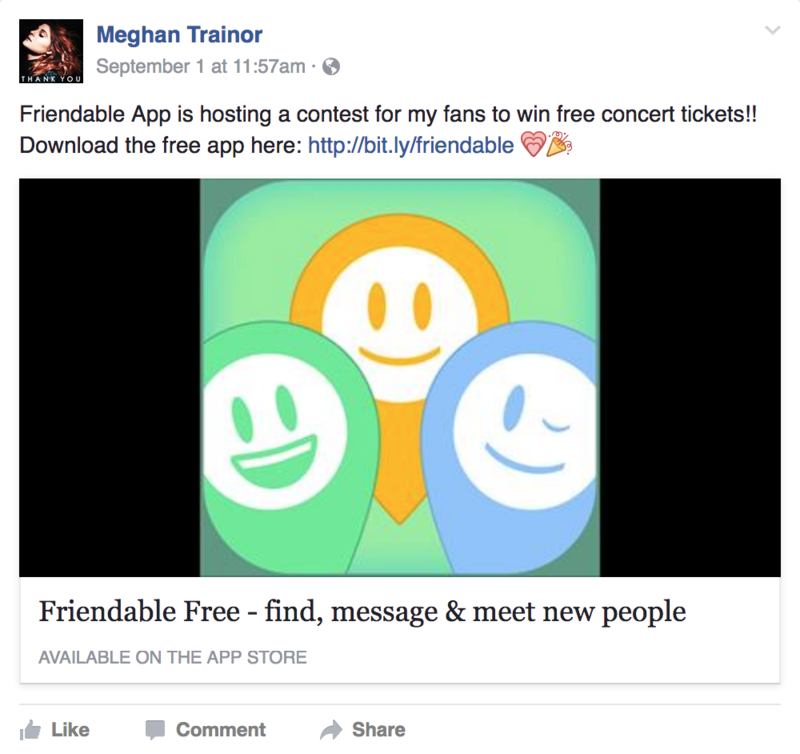 Multi-Platinum singer and actress Jennifer Lopez, Teen heartthrob Austin Mahone, Party Rock celebrity RedFoo of LMFAO, and as of last week, the 2016 Grammy award winner for “Best New Artist”, Meghan Trainor, with the announcement of Friedable’s concert ticket giveaway for three of her tour dates. The combined social media reach of the foregoing celebrities exceeds approximately 150 Million active followers and has strongly enhanced user acquisition initiatives for Friendable. Friendable, Inc. (OTC Pink: FDBL), and Epic Records, a division of Sony Music Entertainment owned by Sony Corporation (NYSE: SNE) just announced a promotional partnership whereby there will be a variety of promotional initiatives including but not limited to concert giveaway’s, social media promotion, and other contests all held within the Friendable app. The internationally acclaimed all girl group, Fifth Harmony, released their music video “All In My Head” (Flex) featuring Billboard’s Top New Artist for 2016, Fetty Wap. Celebrities have a way of driving success to brands. The Friendable brand is no different. FDBL noted the additional increase in the use of its app among the college and over demographic in the past 12 hours. And prior, saw a “Sheer Surge in Downloads and Usage” among teens after the Austin Mahone Post. With over a million downloads prior to these celebrity influences, we are anxious to see new numbers form the company. Friendable Inc. has one goal: increasing shareholder value by attracting more users and providing an experience which encourages them to spend more time in the app! Could Friendable, Inc. (OTC Pink: FDBL) be a social media takeover candidate? FDBL may not be at these levels much longer. Friendable, Inc. is the mobile-social network focused on the future, rather than sharing the past, where it’s all about having location specific and nearby opportunities to connect with others. The Friendable brand represents a friends-first approach and takes all the pressure off for its users, making it simple to make new connections, create meetup style events or simply tell others what you are “Friendable for.” Then, based on shared interests and location, users can engage with what makes sense for them. Increased user interactions will allow Friendable to offer advertising and sponsorship opportunities to local venues and businesses, and begin to generate revenue by providing these venues with location specific opportunities to reach potential customers when it matters most: when they are nearby and looking for something to do or someone to do it with. As of April 2016 Friendable has over 1 million downloads and 700,000 registered users.